While the author or anyone given access to the author's files (scientific administrators, graduate students, librarians, etc.) may submit a manuscript to the NIHMS System, approval of the PDF Receipt and web version of the manuscript must be done by the PI or an author. 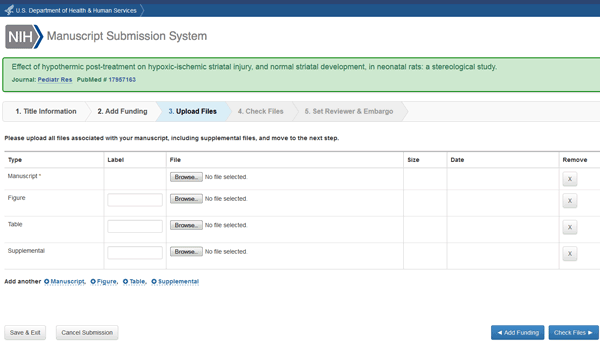 Manually enter the information by typing in the name of the journal and the manuscript title. Locate the citation in your MyNCBI Bibliography. Once you have finished entering/selecting journal and manuscript title, click Add Funding. Search for and select the appropriate grant. You can search by first and last name and/or grant number. Select either yourself or someone else as the reviewer. Generally the submitter is the reviewer. Set the embargo period according to the policies of the publishing journal, generally 12 months is the common embargo period. To determine the exact period refer to http://www.sherpa.ac.uk/romeo/search.php . 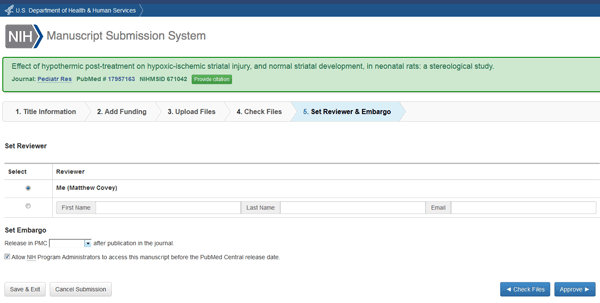 Once you have selected the reviewer and the embargo period, click Approve. NIHMS FAQs are located here. NIHMS Submission Tutorials are located here. 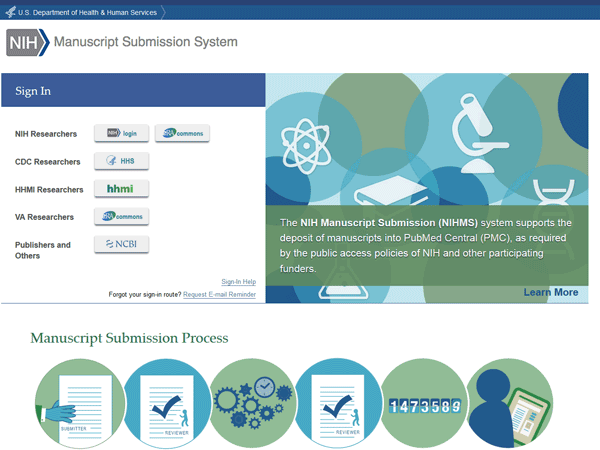 Note: The NIH Manuscript Submission Reference Number (NIHMSID) is a temporary identifier to be used only until the PubMed Central Reference Number (PMCID) has been assigned. For this reason, the NIHMSID becomes invalid 3 months after the paper is published. See this NIH Notice for more information. See the NIHMS System User's Guide for help with the NIHMS System. To request corrections, follow the guidelines listed on the Request for Corrections page. Once you have requested all the necessary corrections, click Send. You will be notified by email when the corrected Web Proof is ready for review. If you are finished reviewing Web Proofs, click Log off in the upper right. If you need to review another Web Proof, click Go to Manuscript List and repeat the steps outlined above.